I like this stand for the simple reason that both the tabletop and frame fold like an ironing board for storage in a corner or closet. I also like the rigid frame constructed of 1 1/2" tube steel. It opens to reveal a 34" x 21" rigid work station. The well-made rig is robust enough to handle resizing magnum rifle cartridges without a problem. Adrian Lundeen, my mentor in things related to tools and workshops, once told me, "Before building a work bench, first find a comfortable stool. " Old Ade was right, as proven to me many times over the years. You see his sage wisdom wasn't just about comfortable stools, he was talking about the need to think before you made a first cut. 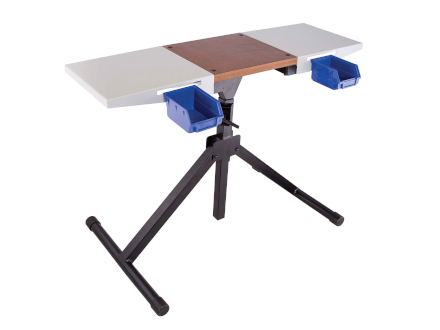 I mention this because this loading bench's frame is height-adjustable, from a low of 28.5" to a height of 45" which means you can sit or stand. And if you decide on a stool, just about any height stool that feels good to sit on will work fine. Sorry, Ade. Tabletop width adjusts from a narrow 13" x 12", that spreads opens to a wider 39" x 12". That translates into nearly copious room for presses, powder measures and loading blocks. The two side shelves are like wings that fold open or down and accommodate free standing trimmers, scales or almost any reloading tools. 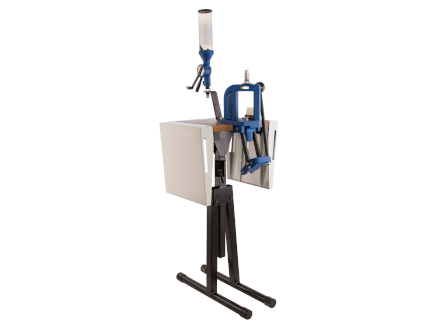 Additionally, the reloading stand includes two side bins good for holding components or small tools. The stand arrives mostly assembled and the DIY here's-how-to-put-it-together instruction sheet is clearly written. So naturally it follows, assembly is laughably easy. From box cutter to finished took me less than 20-minutes (Four bolts and a clamp). Drilling the holes and mounting the press took another ten minutes. Finally, I bolted my single stage press on the wooden center section. With the wings up, my powder measure is mounted to a 1 X 1 -foot 1/2-inch board C-clamped to one of the side shelves. The top is too slick for the powder scale to stay put when operating the press. Tabletop height adjusts 28.5" to 45"
Width adjusts 13" x 12" to 39" x 12"
As an Amazon Associate, Shooters Reports earns from qualifying purchases.